Thrive Themes Membership Vs. Clickfunnels - Which One Fits You Best? Thrive Themes Membership Vs. Clickfunnels - Which One Fits You Best? If you need a website with any sort of lead generation capabilities chances are you’ve heard of ClickFunnels. ClickFunnels is a feature packed platform based entirely around the sales funnel concept. It offers extensive functionality, including customized funnel templates, membership areas and split testing features. The Thrive Themes Membership is a suite of conversion focused WordPress plugins and themes, with tools ranging from page builders and scarcity marketing timers, to landing page templates and A/B testing tools. In this comparison we’ll look at which platform might best suit your particular goals. ClickFunnels vs. the Thrive Membership - Comparing Apples to Oranges? A sales funnel builder vs a suite of WordPress plugins? While on the outside the two may seem very different, both are capable of creating powerful conversion optimized funnels with A/B testing capabilities. A funnel is the process of moving a lead towards a conversion goal. Funnels can be anything from a simple set of pages to a complex, structured sequence. 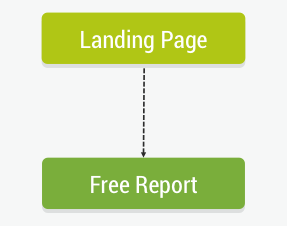 A landing page that offers a free report in exchange for a visitor's email address. The goal of this type of funnel is to grow your email list. A webinar registration page that offers a free report on sign up to increase conversions. Once the live webinar has passed, any visitors who missed the webinar are directed to a third page, which is the replay page. Both the live webinar and the replay page lead to to a sales page (connecting to an offer made in the webinar presentation). A free, 3-part video course that leads to a moderately priced and advanced 5-part video course. Visitors who purchase the course are directed to an upsell page where they can buy access to a premium membership site. Visitors who don't buy the initial course get taken to a downsell page where they are offered a low price e-book. If the e-book is purchased they get offered the premium membership. Although Thrive Themes isn't advertised as a funnel building solution, most of the funnels you can create with ClickFunnels can also be accomplished with Thrive Themes and Plugins. The two platforms differ in their built-in features, functionality, and price. To start off we'll compare the general features of two programs, then get into a more detailed comparison of specific funnel types. ClickFunnels Standard is over 5 times more expensive than the Thrive Membership. What you’re paying for with ClickFunnels is the ability to integrate all the funnel steps within the one platform. ClickFunnels Standard still requires you to connect with third party programs for emails and payments, you can configure these within the ClickFunnels interface. While it's not an all in one platform, Thrive Themes easily integrates with all the tools needed to a create fully functioning funnel. With Thrive Themes, you need to go into the third party programs directly to configure them. To explain this difference, lets look at the example of setting up a payment page. By connecting your ClickFunnels account a the third party payment system such as Stripe, you can create a payment page from within your ClickFunnels interface. This means you can create and edit your product details and order forms from within the ClickFunnels platform. When using Stripe in conjunction with your Thrive Themes Suite, you have to configure your checkout page details within the Stripe plugin, and then link to that checkout page. This all in one principle for ClickFunnels includes hosting too. With ClickFunnels your hosting is included. With Thrive Themes you need your own. Compared to the price difference between The Thrive Membership and ClickFunnels, getting your own hosting is an inexpensive extra step, and as you'll read in the Website and Blog section of this comparison, the hosting provided by ClickFunnels is a double edged sword. The price difference between ClickFunnels Standard and ClickFunnels Etison Elite is because it Etison Elite includes its own email autoresponder, CRM and affiliate management system. Do They Look after Their Customers? Both ClickFunnels and Thrive Themes have a fantastic customer support. They each include enquiry responses within a few hours, a library of tutorials, webinars and how to guides, as well as continual updates and feature improvements. Thrive Themes has more detailed tutorials available on individual features, whereas ClickFunnels relies more on live webinars (and replays) and direct customer support enquiries. It is easier to get the answers you need with Thrive Themes because of the well indexed tutorials, while ClickFunnels requires a lot more sifting through existing content. Would You Like a Website with that Funnel? The Thrive Membership is more focused on your website in general, not just the funnels within it. The membership includes all the tools needed to build a fully integrated, conversion focused, search engine optimized website. It’s important to note that the Thrive Membership is not a hosted solution, which means you need your own hosting, domain and WordPress website before your can start building your content with Thrive Themes. All the tools in the Thrive Membership are WordPress plugins, which you install on your own website. The benefit of this is you own the pages you create, since they are hosted on your WordPress website. If you cancel your membership, your pages will remain online and you will still have access to them. Since Thrive Themes is built specifically for WordPress it allows you to make the most of the already powerful platform. You can optimize your entire website for conversions, not just your funnels. An example of this is being able to show specific opt-in offers based on the subject tag of a blog post. ClickFunnels is a hosted platform, meaning it takes care of the domain and hosting in house. This is great if you just want a funnel and not an entire website, because you'll have everything you need to get that funnel on the web immediately. If you cancel you ClickFunnels account however, you lose access to all of your funnels and they wont be live on the web anymore. You will also lose the domain attached to those funnels. You can pay a lower monthly fee to keep your funnels and the domain on standby (at the time of writing this it was $9.99/m) but your funnels will still not be active or accessible during this time. If you want any other website functionality, you will have to use a third party program such as WordPress to create the rest of your website content. You can then either use the ClickFunnels domain separately for any funnel content, or you can use a ClickFunnels plugin to place your funnels within your WordPress website. It’s important to note that the plugin limits some ClickFunnels features, such as order pages and membership areas. With Thrive Themes you own the domain, so your website and its URL will remain the same even if your Thrive Membership ends. This ensures you don't waste the SEO and backlinks you've built over time. The Thrive Themes Suite is full of tools that make page creation and optimization easy. The Thrive Architect is a point and click page builder that’s not just for landing pages. It can be used to construct your entire website. ClickFunnels on the other hand only creates funnel specific pages and is not suitable for website creation. You would have to use a third party program to create your website. Here we’ll cover the universal features that apply to all funnel types. This is to get an overview of the basic functionality of the platforms, before getting into the specifics of each funnel type. The Thrive Membership does not offer a visual representation of your entire funnel and its conversion percentages. This makes it harder to see how your sales funnel is doing and which steps you can improve on. You can however easily split test your landing pages based on an array of different conversion goals, including revenue, visiting a specific page and subscriptions. Thrive Optimize integrates with Thrive Architect to allow you to seamlessly edit and A/B test different page variations. If you don't want to test entire pages, there are also other A/B testing tools available within the Thrive Membership suite. Thrive Headline Optimizer allows you to A/B test headlines of pages, blogs and product names. Thrive Leads allows you to split test every aspect of your opt-in forms. 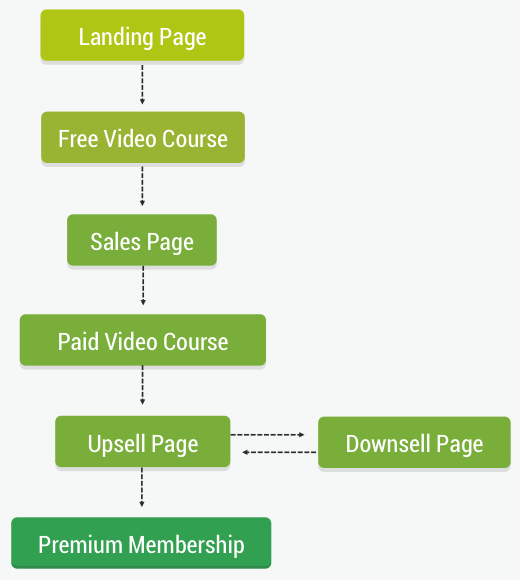 ClickFunnels strength lies in its complete funnel view. You can monitor conversions from step to step, meaning you can easily see what percentage of people who arrived on your original landing page ended up on the next page down the funnel. Having this sort of visualization makes it easy to see the conversions throughout your entire funnel, and identify funnel steps that need improving. Another plus with ClickFunnels is that you can split test page variations within a certain funnel step. For example, if you wanted to test if your landing page works better with an image of your product or just text, you could test both versions of the page to see which one gets higher conversions. The main objective of this type of funnel is to build your email list. This can be done in the form of an opt-in form anywhere on your website, or a specific landing page that offers some value in exchange for your visitor’s email address. These are generally very simple two or three pages funnels. For this comparison, it's important to understand the difference between a lead generation funnel and a website that is completely optimized for list building. A lead generation funnel is a set of pages, that will convert a visitor into a lead. The funnel typically consist of an opt-in page, a confirmation page (optional) and thank you/download page. A website fully optimized for list building can contain lead generation funnels, but also utilizes all the other content on the website to maximize email opt-ins. Let's first take a look at how Thrive Themes and ClickFunnels compare for a lead generation funnel. As you can see, Thrive Themes and ClickFunnels have very similar options when it comes to creating a lead generation funnel. ClickFunnels allows you to build a lead generation funnel on their platform, and offers the possibility to A/B test the landing pages. Thrive Themes has a wide variety lead generation templates and offers A/B testing of specific elements within the landing pages. Now, when it comes to comparing the overall list building capacities of both solutions, ClickFunnels the Thrive Membership are two completely different beasts. ​Within the Thrive Themes suite of plugins, users have access to Thrive Leads, which is a complete list building toolkit. Thrive Leads allows users to create, customize and A/B test virtually every type of opt-in form. Each individual opt-in form type has anywhere from 12 to 66 templates to choose from (325 templates total) that are 100% customizable using the built-in, drag-and-drop editor. Thrive Leads allows testing of not only design, but also opt-in form types and triggers, to see which level of attention seeking actually converts better. Because Thrive Leads is a WordPress plugin, opt-in forms can be tailored to the type of content visitors view through the strategic use of WordPress tags and categories. ClickFunnels list building feature “Clickpop” only offers a limited number of lightbox design templates to customize with the drag & drop editor. Each of the opt-in form templates is a “popup” lightbox that can only be triggered via page load, timer settings or exit intent. ClickPops includes basic split testing capabilities, but only for the design of the lightboxes. ClickPops can not be easily utilized outside of the ClickFunnels platform. If you want opt-ins anywhere on your external website you have to use shortcodes and go back and forth between platforms. Targeting opt-in offers to specific content categories is impossible unless it's done manually for each page. ClickFunnels is not suited for blog post opt-ins or content specific opt-in forms. The Thrive Membership would be the more viable option for lead generation funnels. Its focus on WordPress functionality makes it really easy to add all types opt-in elements throughout your WordPress site. With Thrive Themes you can also create single landing page funnel to drive traffic to. ClickFunnels was not created for list building on a website. It doesn't work intuitively with any other website content besides the funnel based pages and pop ups. Even if you just after lead generation funnel and not an entire website, ClickFunnels would be serious overkill considering the price point. A webinar funnel revolves around getting visitors to attend either a live or pre-recorded webinar that usually leads to some sort of exclusive offer at the end. You can collect attendees through driving traffic to a registration page, or emailing invitations to your existing lists. Both Thrive Themes and ClickFunnels require the use of a third party webinar service in order to run live webinars. Both integrate with the two major webinar programs - WebinarJam and GoToWebinar. These programs handle most of the webinar automation functions for you, such as follow up emails, timed or triggered offers and scheduled replays. The offers allow you to link to an external payment system (such as PayPal) or shop (such as Amazon). If you did want to host a live webinar within the a funnel page, both ClickFunnels and Thrive Themes allow YouTube Live Events to be embedded on your site. This service is available through WebinarJam or YouTube directly. This is helpful for those wanting to keep the whole funnel on their platform, rather than having the actual webinar on the providers site. Thrive Themes is suitable for you if you’re running free webinars for brand awareness, content marketing or audience education. Thrive Themes is also be suitable for webinars leading to a single offer or product sale. If you are doing a live YouTube webinar within a Thrive Themes site, or webinar replays within a Thrive Themes site, you can have an offer section reveal after a certain period of time. This can include a button linking to an external payment system. Thrive Themes offers a pretty handy feature called Signup Segue. It’s a link that sends users to a different URL based on time and date parameters you set in advance. This means if they click on the link before the webinar is due to begin you can send them to a 'the webinar hasn't started yet' page. If they click on the link after the webinar is finished you can send them to a replay page. Signup Segue also allows those already on your email list to register for the webinar automatically, without having to enter their details in a separate registration page. ClickFunnels is a better option if the webinar involves a purchase offer toward the end that you want to track. If you’re doing a live webinar on the webinar providers site you can link back to a sales funnel within ClickFunnels, allowing you to track conversions throughout the sales process. Within ClickFunnels replay pages you can set an offer to reveal after a certain period of time, similar to Thrive Themes. ClickFunnels real strength lies with their automated webinar funnel. 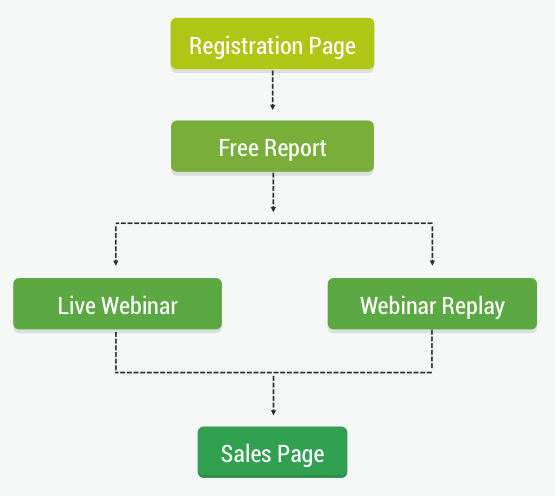 You can create a standalone evergreen funnel using a pre-recorded webinar. The evergreen webinar time and date automatically generates based on when the visitor goes to the site. The platform sends out basic emails with the webinar link. During the webinar ClickFunnels detects how long the visitor stayed, if they saw the offer or if they turned up at all, and sends out follow up emails accordingly. This type of funnel can be quite difficult to set up but once it is, you can set your high converting webinars up on repeat. For live webinars, due to the dependence on third party webinar services Thrive Themes and ClickFunnels offer pretty much the same functionality. The main difference ClickFunnels live webinar funnels is the ability to take payment within the funnel. This allows for more comprehensive tracking of conversions. That being said you can very easily link to a third party payment system if you're using Thrive Themes. Once you start getting into upsells, evergreen replay funnels and membership opt-ins, ClickFunnels is the way to go. If you are just after a simple webinar funnel with replays and single offer, Thrive Themes will more than get you by. This type of funnel leads to the purchase of a particular product or service. If you are selling an e-book for example, a simple version of this type of funnel would be a long form sales page linking to an order page. A more advanced funnel would be a free guide which starts an automated email follow up sequence, ending in an offer to purchase the e-book. A complex funnel would be similar to the above, with the addition of one click upsells and downsells after the initial payment page. Thrive Themes does not include payment systems within the platform. To take payment you have to link to a external payment page, or separate page within your WordPress site that has a payment plugin such as Woo-Commerce setup. This is very easy to do but it makes tracking your actual conversions more difficult. If you are already using third party programs to process and collect payments for your products or services then the Thrive Membership would be a good option for you. It contains all of the funnel steps besides the actual payment stage. If you are doing a long form sales page the Thrive Themes Architect is a lot more user friendly than the ClickFunnels alternative. More buttons, elements and formatting structures allow you to design your page the way you want. Thrive Themes also includes specific templates and tutorials on how to optimize your long form sale page for conversions. ClickFunnels provides a completely inline solution for any sort of purchase focused funnel. You still have to connect with a third party payment system, but you can configure the details of the payments within the ClickFunnels platform. You can set up one time payments or a subscriptions, basic fulfillment emails and delivery information if required. You can also take payment from within a ClickFunnels page. ClickFunnels can follow a visitor right through the purchase process and give you data on the drop off rates at various stages. It also allows for A/B testing of all the elements within the purchase page. If you don’t already have online payment systems in place, or you want an all in one funnel that comprehensively includes all stages of the actual order, ClickFunnels may be the way to go. This type of funnel builds up anticipation to a product being launched on a specific date. It can include countdown timers, email follow up sequences, free video courses to deliver value first and discounts leading up to the launch date. Individual evergreen offer countdown refers to the ability to start a different countdown timer for each unique visitor. For example if you want each new visitor to be offered 24 hours to purchase your product at 50% off. A simple product launch funnel would be a landing page with a countdown timer to launch date. Visitors can enter their email address to be informed when the product is live. A more advanced funnel would be educational video series that is staggered over a few days. The final video leads to an option to purchase the product. A complex product launch funnel would be an evergreen launch. After a new visitor opt-ins an email follow up sequence is launched in which the product is available for 50% off for a set period of time, followed by a 25% off and then full price. The Thrive Themes individual evergreen offer countdown, known as the Thrive Ultimatum lockdown feature, provides visitors with an email link to the offer. The benefit of this system is the email link offer is virtually uncheatable. This helps you ensure this offer is only available to visitors once, even if they try to get it again through workarounds. If the credibility and true scarcity of your offer is important to you, the Thrive Ultimatum lockdown feature for evergreen campaigns might be the best for you. The obvious downside to this type of campaign is it means you have to get the visitor’s email before you can present the offer to them. Both platforms give you the ability to place countdown timers to a specific date on the page. Or if you are after recurring scarcity you can create timers that automatically reset after a specified period of time. Both offer product launch templates with video sequences. You would need to integrate with a third party autoresponder system in order to carry out an email followup sequence. Thrive Themes easily integrates with all major third party auto responders. When it comes to using individual evergreen offer countdowns, ClickFunnels auto detects new visitors to a page then present an offer. It’s generally a bit easier to fool a countdown timer with this type of trigger. This undermines the scarcity of the offer, since visitors who work it out can get the offer anytime they want. The clear benefit of on page detection of new visitors is that you can get an offer in front of your visitor immediately, instead of having to get their email first. With most levels of this type of funnel an email autoresponder is required to set up a launch sequence. ClickFunnels Standard does not include an autoresponder but you can easily integrate with one. It does include built in plain text email responses, but they are very basic and would not suit this type of campaign. ClickFunnels Etison Elite includes an autoresponder system. Again, ClickFunnels offers inbuilt payment processing which an advantage for this type of funnel. A membership area is not a funnel within itself, but it's worth mentioning to explain some of the extended functionality of both platforms. You would either use a sales or product launch funnel to drive leads to your membership area. ClickFunnels offers a simple all in one solution for membership sites. You can process payments on site and control the membership area within the platform. In Thrive Themes you can host all of your content within the Thrive Apprentice feature, but it is not a membership area. It is built to be used in conjunction with membership plugins (some of which are available for free). Thrive Apprentice just provides a platform for you to structure and deliver your content. One feature ClickFunnels offers that Thrive Themes does not is delayed lesson releases. This is great for courses that are run over a series of weeks. Thrive Apprentice would be useful for any free content areas, and with a few simple plugins you could also create paid membership areas. While it is all built in, ClickFunnels actual membership area is still quite basic. You can create very similar content delivery areas with Thrive Themes. If you need a simple website, a blog or to grow your email list, given the cost comparison and WordPress integration, the Thrive Membership is the best choice. When it comes to simple funnels Thrive Themes also holds its ground. If you're looking for a cost effective solution you can achieve a lot of the same things with a mixture of the the Thrive Themes Suite, third party integrations and external services. That being said, ClickFunnels is more streamlined and you get that useful top down funnel view. The more complicated your funnels become the more sense it makes to invest in ClickFunnels. The main determining factors are ClickFunnels inbuilt payment capabilities and membership areas, as well as their easy automation of evergreen funnels. If those things aren't that important in your funnel, or you're already using third party programs for those aspects, the Thrive Membership is a great way of achieving the same funnels at a fraction of the cost. Want to build a high converting website for your online business without spending thousands a year?